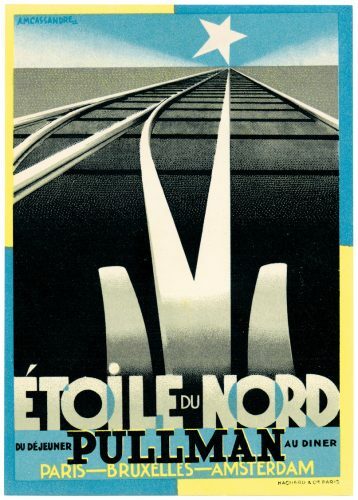 The ‘Étoile du Nord’ poster (shown above in a postcard version) is an opportunity to really look at the work of A. M. Cassandre (Adolphe Jean-Marie Mouron, 1901–1968), as Hollis encourages us to do. Cassandre’s work repays close study because of its great design intelligence. Really looking at the artefacts themselves, whenever possible, is also important because they demonstrate just how thoroughly Cassandre’s work unifies concept and technical execution. The results have a powerful visual, physical, and imaginative presence. 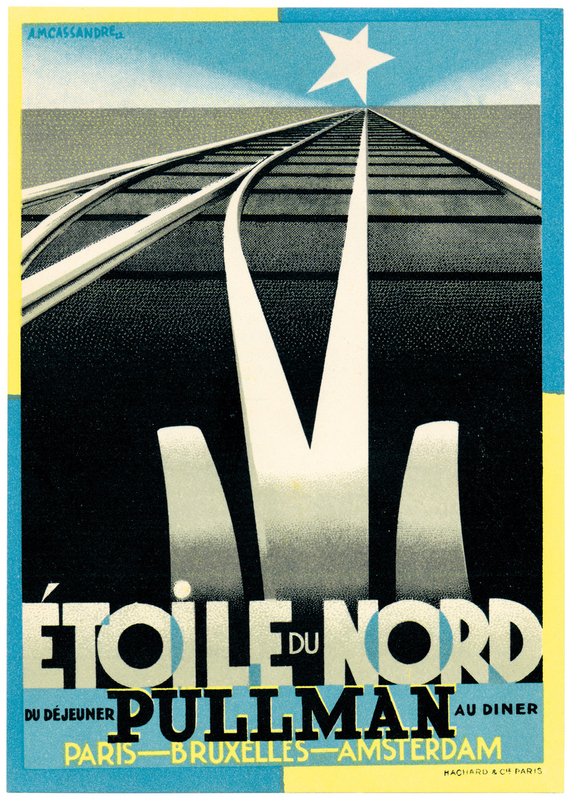 (Upper) ‘Étoile du Nord’, postcard, no date, published by Hachard et Cie (Paris), printed by L. Danel (Lille), gravure in 6 colours. (Lower) Nord magazine, 1930 (May) and 1931 (July), published under the patronage of the Compagnie du Chemin de Fer du Nord, printed by L. Danel (Lille), offset lithography in 2 colours. This postcard is based on a 1927 poster of the same design. The reverse gives details of the luxury high-speed ‘Étoile du Nord’ Pullman service between Paris, Brussels, and Amsterdam. The postcard was printed by L. Danel, which also produced the original poster; it is a good quality rendition of a poster that now sells for tens of thousands of pounds. Nord magazine was issued monthly by the Compagnie du Chemin de Fer du Nord and distributed in the first class compartments of its trains. The cover design, created in 1927 and signed ‘A. Mouron-Cassandre’, was used for many years. Each issue was printed in black and a variable second colour, including yellow, orange, light green, light blue, pink, lavender, grey, and buff. Press advertisements by Cassandre ­sometimes featured inside the magazine. The example shown here, for ‘Dr. Charpy’ health and beauty products, was based on a 1930 poster of the same design. The image makes reference to a study of human facial proportions by the French artist Jean Cousin the younger, illustrated in his book Livre de pourtraicture (c. 1595). (Upper) Acier, 1936, published by the Office Technique pour l’Utilisation de l’Acier, printed by E. Desfossés-Néogravure (Paris), gravure in 3 colours, overprinted by letterpress in 1 colour. 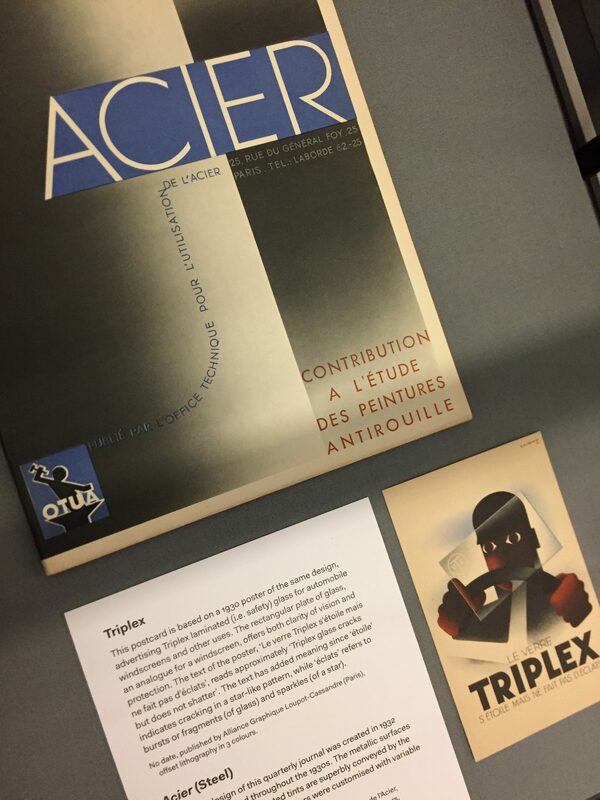 (Lower) ‘Triplex’, postcard, no date, published by Alliance Graphique Loupot-Cassandre (Paris), offset lithography in 3 colours. This postcard is based on a 1930 poster of the same design, advertising Triplex laminated (i.e. safety) glass for automobile windscreens and other uses. The rectangular plate of glass, an analogue for a windscreen, offers both clarity of vision and protection. The text of the poster, ‘Le verre Triplex s’étoile mais ne fait pas d’éclats’, reads approximately ‘Triplex glass cracks but does not shatter’. The text has added meaning since ‘étoile’ indicates cracking in a star-like pattern, while ‘éclats’ refers to bursts or fragments (of glass) and sparkles (of a star). The cover design of this quarterly journal was created in 1932 and thereafter used throughout the 1930s. The metallic surfaces suggested by the graduated tints are superbly conveyed by the luxurious gravure printing. Covers were customised with variable overprinted text. (Upper) Nicolas wine catalogue, November 1935, published by Établissements Nicolas (Charenton-le-Pont, Seine), printed by Draeger Frères (Montrouge), letterpress in 9 colours (gloss and matte) with an additional embossing; interior pages printed letterpress in 7 colours. (Lower) ‘Maison Prunier’, postcard, 1934, published by the restaurant Maison Prunier, letterpress in 6 colours. This wine catalogue is among the most lavish commissions completed by Cassandre. The cover design is an impressive synthesis of production and visual effect, in which spatial recession is achieved through multiple colour planes, trompe l’oeil perspective, and the contrast of gloss and matte inks and the embossed ‘N’. This postcard is based on a 1934 poster of the same design, whose imagery was additionally used for menus and other printed matter. From a present-day perspective, the image appears vaguely surreal, though the Surrealist work it evokes, Salvador Dalí’s Lobster telephone, was in fact created two years later. The Maison Prunier was (and is still today) a Paris restaurant specialising in seafood. A London branch, which opened in 1933, was in business until the mid 1970s. 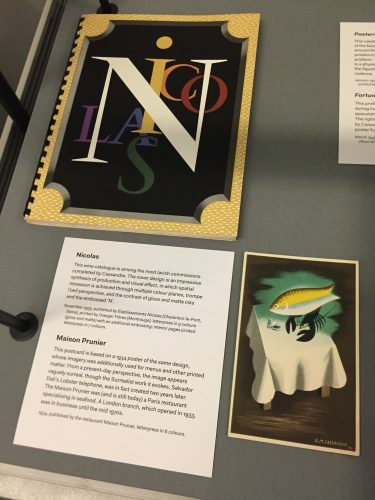 (Upper) ‘Projects for four posters: a portfolio by A. M. Cassandre’, Fortune magazine, March 1937, published by Time, Inc., letterpress (text) and 4-colour process offset lithography. (Lower) Posters by Cassandre, exhibition catalogue, January 1936, published by the Museum of Modern Art (New York), printed by The Spiral Press (New York), letterpress in 2 colours. This profile of Cassandre was published in Fortune magazine during his first visit to the USA in 1936–37, and includes four speculative poster projects commissioned by the magazine. The right-hand column of the text includes a lengthy quotation by Cassandre describing his understanding of how a successful poster functions. This catalogue was for a 1936 exhibition of Cassandre’s posters held at the Museum of Modern Art in New York. 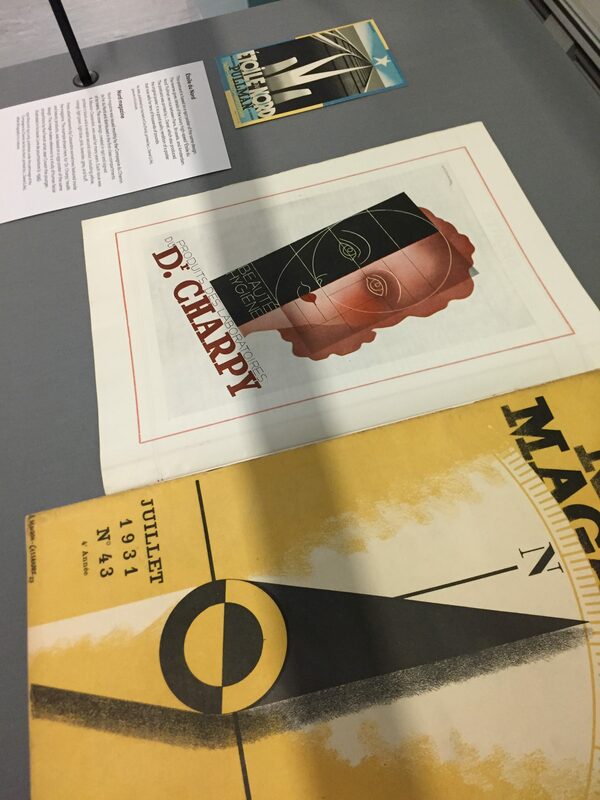 Cassandre wrote at around this time that a poster should contain the solution to three problems: an optical problem, a graphic problem, and a poetic problem. The optical clash of the cover’s complementary colours is a physiological equivalent to the arrow’s graphic piercing of the figure’s eye/vision. The poetic effect is a compelling, gripping violence. The display ‘Have you ever really looked at …? 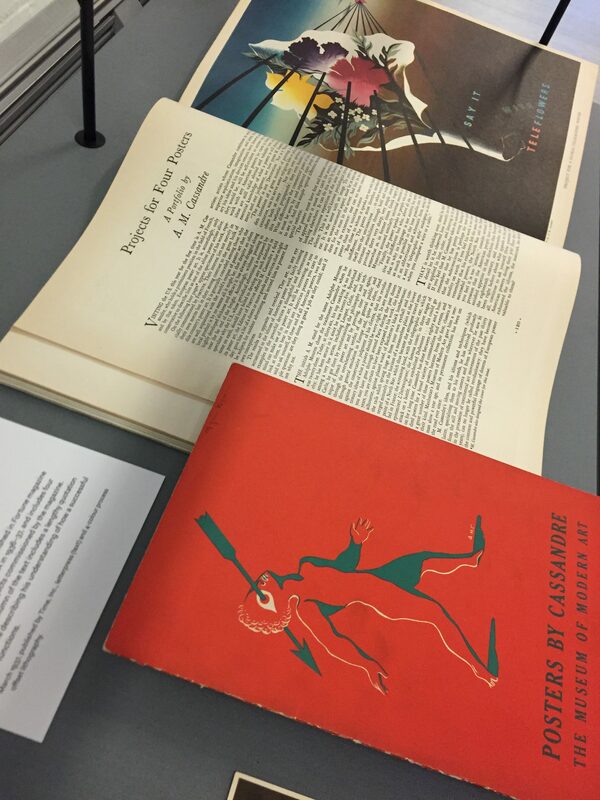 A. M. Cassandre’ was assembled by Eric Kindel, to mark the arrival of two new vitrines in the Department, courtesy of the Museum of English Rural Life, University of Reading. With thanks to Darryl Lim, James Lloyd, and Alice Savoie. This entry was posted in exhibitions and tagged Cassandre. Bookmark the permalink.